Because people believe root canals are too long a procedure, they may decide to forgo the event altogether, which could cause harm to your oral health. Your Lancaster family dentist can perform the whole root canal procedure in about 1-2 hours, with no additional appointments to complete. Your dentist will of course schedule a follow-up appointment to make sure everything is as planned as well as to discuss the possibility of a dental crown to complete the natural look of your tooth. Maybe back in the old days when anesthesia wasn’t made readily available as it is today did root canals hurt. Nowadays, anesthesia is used carefully in order to ensure every patient undergo a procedure with minimal to no pain involved. Sedation dentistry is always a possibility when you’re the type of person who is anxious about dental visits. Some dentists may recommend a tooth extraction under certain scenarios, but you should always consider a root canal if applicable. The reason being: because you still have a portion of your real tooth still intact, which is better than having a tooth extracted and then receiving an artificial dental implant. 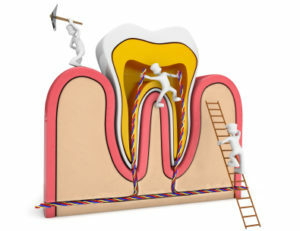 Speculation looms around the topic of root canal and illness/disease. Theories have been proposed, but no scientific evidence suggests any correlation between root canal and illness. The main goal of a root canal is to prevent illness by restoring and repairing the damage that has been done to the tooth through a long period of decay. Root canals are not a procedure anyone looks forward to, but it sure is better than living with a lifetime of severe pain, which left untreated, could pose serious health risks. Don’t let root canal myths steer you away. When in doubt, ask your family dentist in Lancaster for advice for the best scenarios. They have performed the necessary research to help make informed decisions. This entry was posted in Lancaster Dentist and tagged root canal causes, root canal pain, root canal recovery. Bookmark the permalink.